Some time ago I wove a few towels with five wide ivory stripes and six narrow spruce ones. 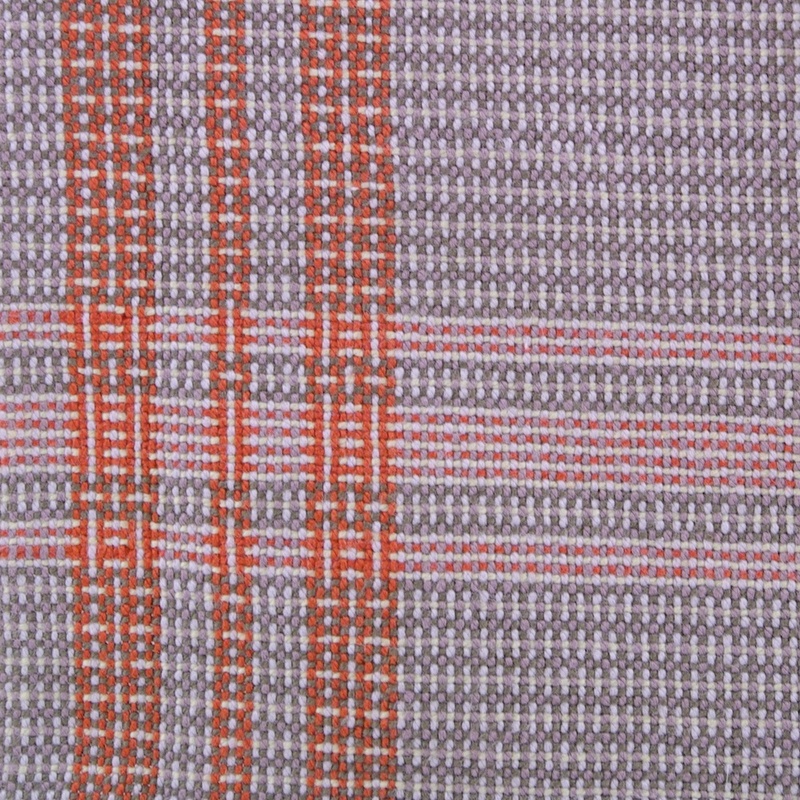 I chose a very simple design and weave structure because I wanted to try out a new technique — inlay — where a supplementary weft thread is laid into sections of the fabric. When I showed a completed towel to my partner, she said, “Now there’s a kitchen towel!” At first was I taken aback because I thought I’d been weaving towels all along. But I also knew what she meant. We are accustomed to kitchen towels having a certain look: e.g. 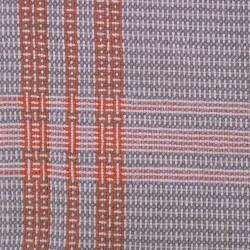 a simple plaid with one of the colors frequently being white; or a solid color with a decorative band. I did not have this “classical” towel look in mind when I designed this project. I enjoyed the slow, exacting inlay process, but the resulting towels did not make my heart sing the way other designs have so I didn’t continue making them. I figure, if I am going to design and weave a towel, I want to make it as beautiful as possible. Weaving is one of the ways I bring beauty into my everyday life, so I am happy to leave that more conventional look to commercially produced towels while I explore color and pattern. I’ve always enjoyed looking at displays of color — bolts of fabric, skeins of embroidery floss, boxes of colored pencils — where there are several shades of each hue. Now that I am a weaver, I pay attention to color combinations. I flip through brochures at the paint store and the catalogues that arrive in the mail. I notice people’s clothing. I observe the natural world. Each of my towels has a story behind the color inspiration. Here is one story in more detail. Almost every morning the dogs and I walk up the hill to a vineyard, down the other side and back. These walks are an important part of my morning routine and my observations often work their way into my towels. One morning after a storm we came across a fallen tree. Someone had already moved the trunk off the road. The dogs chewed on the branches while I took in the colors. The small rust colored fungi scattered along the trunk caught my attention. As we continued up the hill, a towel idea began to take shape. On the way back down the hill, I picked up a twig from the tree and brought it home. I held up tubes of cotton to see which colors were the best matches. 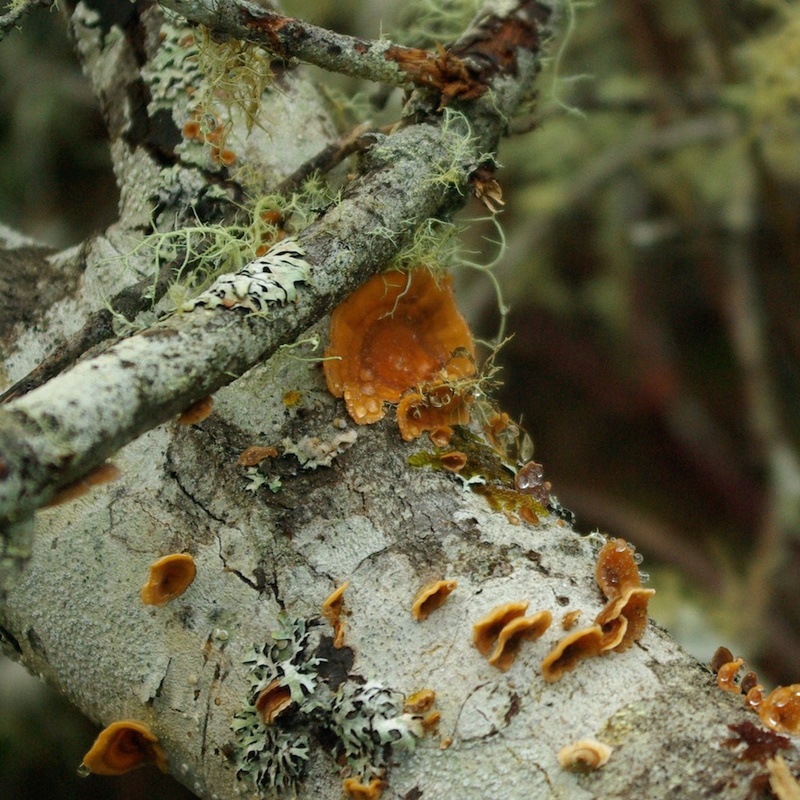 Not wanting to break any of the fungi off the trunk, I took some other tubes with me on an afternoon walk. I didn’t want to recreate the tree trunk in a representational way, but to take the colors and work them into one of my preferred designs. I saw the fungi as accents on an otherwise gray and white fabric. Once the warp (the vertical threads) is on the loom, I weave a sample trying out different colors in the weft (the horizontal threads). This is where the colored threads interlace, making color theory come alive and teaching me things that I don’t see when the tubes of cotton are next to each other on the shelf. I notice that the dark purple makes the colors pop whereas the beige makes them look washed out. I notice that when it’s next to light gray, melon and stone, the ivory looks green. These observations add to my understanding of each color and influence subsequent color choices. After the sample has been washed and dried, I decide which sections I like best and start weaving towels. The original source of inspiration — the fallen tree — fades into the background and my love of pattern and variation kicks in as I figure out ways to make each towel different. I relax into the rhythm of weaving and the joy of making cloth. It still amazes me that I can take hundreds of individual threads and make cloth, something so basic in our lives. My invitation to you: What color combinations inspire you? I’d love to hear your story — and maybe even weave the colors into a towel! 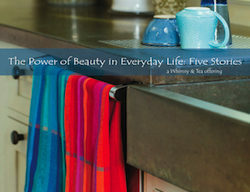 Please accept this gift that celebrates and explores the power of beauty in everyday life. Get a monthly heartfelt note about slowing down and appreciating the beauty in everyday life. But it’s too beautiful to use!